Romanesco. And yes, it really is that color. I have discovered the most amazing vegetable. It is called Romanesco and it looks like it belongs in a sci-fi move. Seriously weird. What an example of fractals in nature! Its like you’re eating a science experiment. I asked the lady what it was, and she described it as a mix between broccoli and cauliflower. I just couldn’t resist. It was so bright and so magical looking. The only downside? Its quite pungent. The whole car smelled like something had gotten out of the bag and been left in the sun. We’re storing it in a tightly sealed ziplock to prevent it from fumigating the fridge. But the taste? YUM! It has the solid texture of cauliflower but the taste of broccoli. We made some beans, couscous, baked tofu and a veggie stir-fry… and so good. I’ll definitely pick up more of this amazing beautiful vegetable. We have a performance coming up. With fire fans. Which I’ve practiced with on fire a total of three times. Yeah, I’m more than a little anxious about this. The tough thing is that it is difficult to practice privately with them on fire. Despite my performance history and the fact that I’m in a dance troupe that, well, performs, I’m actually incredibly shy. And hate Hate HATE being watched while I do something I’m anxious about. Add to the fact that when I hold the fans my mind totally goes blank and all my dance auto-pilot moves seem to escape me… very tough to practice. I was planning on heading to NJ last weekend to celebrate Tom’s birthday and see Jen & Andrew’s new place. The snow & ice put that plan on hold, but thankfully so. When I got the news early this week that we’d be performing, I knew I had to practice, on fire, in as much solitary as one can practice fire. What better place to wave fans of flame in the air than the sticks of Jersey? I got some fuel (lamp oil), and asked my Mom if she’d help. All we needed was some duvetyne and we’d be set. After some back-and-forthing of schedules, I finally managed to get some from Chip- awesome. He gave me some great pieces that are perfect. Too small to really use on set, just right for putting out flames. (Chip, once again, you’re my hero!) Meanwhile, Mom borrowed a bag of it from the prop-shop. I really consider myself lucky to have so many friends and family members who are resourceful! Mom and I ventured outside, with a fair amount of trepidation. I think she was really worried that she’d have to put out big flames, and concerned about doing her job as safety well. After lighting up in the backyard, we both took a look at all the leaves by my feet and decided moving to the driveway would be a much smarter idea. So move we did, and I waved the fans around, not quite sure what to do, and still absolutely terrified of spinning them. A few burns later, once we were both much calmer, Mom started helping me with dance form, and soon I was spinning… not quite like a pro, but not nearly as scared as before. Arms out in dance posture, elbows bent. Shoulders back. Don’t lean forward into the flames, stand up straight. Don’t look at the fans. Shoulders back. Arms out. I dropped them many times, but Mom never had to rush forward with her duvetyne. Tom got anxious about the trees, but the whole practice proceeded without incident. 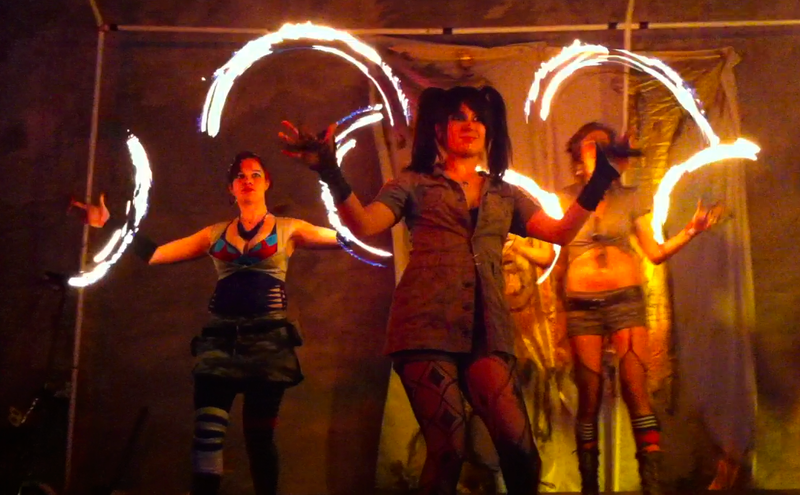 I even lit up the fire fingers… amazing how they are so tame in comparison! Smaller wicks, sure…. but the whole idea of not having to spin them and not worrying about dropping makes them easy-peasy next to the fans! Oh, and the birthday dinner that was re-scheduled? Not too shabby! We went to Riley and Jake’s, a recently re-opened spot near their house. Much better than the decor would lead you to believe! I’m going to turn into a rabbit. And love every minute of it. Oh, and I can’t wait for the Dawn Patrol ride. I got the postcard in the mail yesterday, I must have given them my address at the last one. Such a nice and bright card! Hope the weather is nice. I even bought a camera strap so I can try to take some pictures during the ride. Not sure how well my camera will do with it, but its worth a shot anyway. Now, to catch up on some Doctor Who (Neil Gaiman’s episode!) and then to finish making dinner… a good night ahead. My favorite local bar (Lucky 13) used to have the best samosas. They weren’t traditional style, by any means, but they were tasty, and one of my favorite go-to-meals. They’ve since switched chefs (a few times since then I think) and I’ve been craving good ones ever since. The ones at work (when Indian is the ethnic food of the day) aren’t bad, but they keep them pretty mild. I picked up some won-ton wrappers a bit ago, with the intent to make some ravioli. But when we ended up with some leftover mashed potatoes this past weekend, Chris suggested I use them in some samosas. Brilliant! What a great re-use. I bought some canned peas, since I didn’t want a whole bag of frozen ones and the store didn’t have any fresh of the right kind. Honestly, they kinda freaked me out… canned vegetables are pretty gross. But mixed in with the rest of it, not too bad. I combined a few recipes I found online (this one and this one, mainly) but majorly upped the curry and red pepper. Perhaps a bit too much… I started out sauteing some garlic and onion, threw in the peas and some spices, stirred it around a bit, added some more spices, threw in the potatoes, kept stirring, added more spices… you get the idea. I had some trouble with the wrapping bit, I kept over-stuffing them. It was fun though. And the result? Rather good I think. Would definitely be better if I had made a good curry to go along with, instead of the fish and couscous that made up the rest of the dinner, oh well. Still tasty, no matter what they were paired with. flowers from the fish store! I love my local fish store, Ippolitos. They always have the best fish, and lately the shopping experience has gotten more and more entertaining. And this weekend- Chris surprised me with flowers from the store. I love that you can buy fish, veggies, bread and flowers all at the same place. The other weekend they had balloons out front. No particular reason, just to have balloons. If you’re in Philly and need something to make for dinner, do yourself a favor and swing by the store… you’ll have a great experience and walk away with delicious food. This weekend included a lot of driving. I went my Mom’s, drove over to Verizon (still no new phone though, boo), and then drove to South Orange for a huge family night. It was nice to drive around Hunterdon County, roads that I’m actually used to. It helped getting used to the new car. Driving home on the turnpike- well, I was pretty sure I got lost getting off the turnpike, but turns out I was going the right way after all. (Which was a huge relief because it took two hours to get home, so it was already rather late.) And I parallel parked my car without crying! I know for a lot of people that’s not a big deal, but I freak out about parking. I never really had to parallel park before, and of course now I live in South Philly where its the only option. I’ll have to get better at it eventually, but its pretty nerve-wrecking for now. The rest of the weekend was pretty relaxing. Some grocery shopping, some cheese and wine at Tria for lunch, some cheesy movies, and a delicious dinner. I made mashed potatoes! My favorite food ever. Hoping the week goes well. I don’t have very much experience roasting chickens. It seems like a pretty classic meal, but until a few months ago, it really wasn’t on my radar as something to make myself for dinner. Then through some over-buying of chicken breast for jambalaya (we buy chicken for the jambalaya from a Reading Terminal Market vendor, so it isn’t the prepackaged chicken breasts I’m used to using) we ended up with some extra chicken needing to be cooked. Chris suggested we try roasting it…. so tasty! It is surprisingly easy, too. I can’t believe its taken me this long to figure that out. So last time we were at the market, we swung by the folks we bought the chicken from, and saw these Cornish hens. The last time I ate Cornish hen was at Medieval Times, in grade school (the time of the Orange Incident, as all Woodglen students I’m sure will remember). It was dark, we ate with our hands, it was pretty fun. But this time it seemed like a better idea to try for a more adult meal. Chris made some sort of spiced concoction for the skin (either though neither of us eats the skin, we decided next time to go simple with just some salt and pepper, cause the flavor didn’t really get past the crunchy outside) and we made a mission fig, crushed cashew, onion, garlic and spicy pepper stuffing. We put basil under the wings, too, though I’m not sure how much taste that added. While the flavoring outside didn’t really do much, the stuffing did a good job permeating the meat, and was even better once I figured out how to get it out of the hen and mix in with the rest of the meal. To go with our Cornish Hen experiment- tomato rice made with chicken stock, stir fried peppers and snap peas. What a tasty meal! Although, the one down side is that the small bird was a lot of work to eat. Pretty worth it though. The good side about a meal you need to work for? You don’t end up over-eating because it’s so tasty. Definitely going to try this one again. Snowy Commute, originally uploaded by ducksRfriends. I tried to get a shot of the beautiful snow covered trees and the rest of the winter wonderland from the train, but unfortunately my phone just blurred it all…. The roads were full of snow, commuters bundled and well booted, the shuttle warm and the driver ( <3 Leon! Best driver ever) friendly. Now, stuffed from a delicious dinner at Lucky 13, going to watch Resident Evil (so delightfully cheesy!) drink port and knit. Not a bad way to wrap up a snowy non-snow-day.